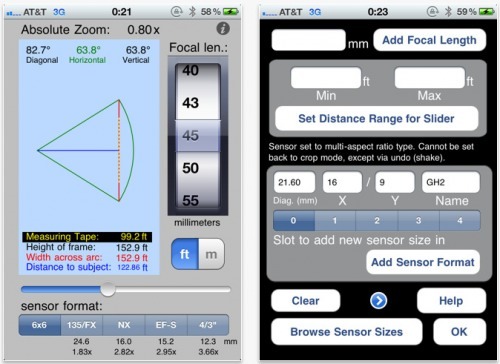 Physical Software has announced its new app, "Angle of View," a field-of-view calculator and sensor size database app, targeted at amateur and professional photographers, directors of photography, students and teachers, and anyone who uses cameras on a regular basis. "Angle of View" enables quick, one-handed operation, making it easy to determine field-of-view angles and distances, and to determine the equivalent millimeters between five customizable sensor sizes simultaneously. The main screen of "Angle of View" is a color-coded display showing angles (in degrees) and distances (in feet or meters). The user sets a chosen sensor, focal length, and distance-to-subject combination via gestural controls, and the app updates its graphical and numerical displays in real-time when the gesture is performed. The angles shown are horizontal, diagonal, and vertical, and the distances shown are distance-to-subject, and the distances across the frame horizontally and vertically. A graphical angle represents the camera's horizontal field of view, if viewed from above. The user can also pinch to resize a dashed-yellow "measuring tape" to provide a sense of scale. The measuring tape scales in real time when the distance or focal length is changed. "Angle of View" relies solely gesture-based controls. For instance, the user inputs the focal length via a spinning wheel control, which mimics a zoom lens. All the gestural controls are fully customizable via the app's preferences screen, which uses a custom oversized numerical keypad for input and features a powerful format editor. "It's supposed to feel like using a modern piece of digital photographic equipment," said Angle of View lead developer, Jonathan Gilbert. "When you're actually using it, everything is set with your thumb, and it responds immediately. No typing is required. However, you can also customize everything, if you feel the need." The app relies on a database of user-modifiable sensor formats. A unique format editor lets the user enter the native dimensions and name for a format, and even supports Panasonic's "multi-aspect-ratio" formats, along with multiple levels of undo and redo. Users browse the database, load a format into the editor, modify the format's size data, then save a new copy or overwrite the original, assigning the format to one of five slots in the dashboard on the main screen. "Angle of View" allows sensor formats to be modified on the basis of their aspect ratio. This advanced feature means that the app automatically crops or resizes the imaging area of the sensor intelligently, saving the user from complex math. The user changes a format's aspect ratio in the format editor, then the app uses existing data to intelligently modify the format. If the sensor is a "multi-aspect-ratio" sensor (ala Panasonic), its native diagonal size and surface area is preserved. For other sensor types the app intelligently crops from the proper side of the sensor, with a mind to its native horizontal and vertical dimensions, which are also preserved in the database. Another unique feature of "Angle of View" is its heads-up dashboard display of five formats. The user selects one format to act as the currently active base format. Meanwhile, the dashboard displays the "crop factor" for each of the other four formats, relative to the user's selected format. This feature seems aimed at making sense out of a common source of confusion. If a user is unfamiliar with 135 format, they can choose whatever format they prefer. The dashboard feature of "Angle of View" could prove extremely useful in multi-camera shoots in which some of the cameras use differing sensor sizes. If the DP needs the shots to match, they can use "Angle of View" to determine which focal lengths to use on which cameras, in order to achieve the same field-of-view for the shots. Another feature to note is the "Absolute Zoom" display. This shows a "magnification factor" that the app calculates by dividing the distance-to-subject by the distance across the frame. The goal of this seems to be to give people an absolute number to use when comparing lenses between formats, to see which one actually gives the most telephoto or the most wide angle. The app's documentation notes that this feature is aimed at camera shoppers who are often confused by the relativistic "10x" or "20x" zoom numbers that camera manufacturers use for their products. Angle of View 1.0 is $1.99 USD (or equivalent amount in other currencies) and available worldwide exclusively through the App Store in the Photography category. The app is ad-free and the developer promises free updates for life, including free updates to a future iPad-optimized version.